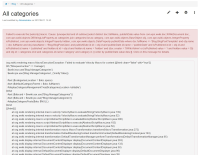 Expected results: "Implement the display of blog posts inside the categories home page (Blog.CategoriesSheet)"
Actual results: Failed to execute the [velocity] macro. Failed to execute the [velocity] macro. Cause: [unexpected end of subtree [select distinct doc.fullName, publishDate.value from com.xpn.xwiki.doc.XWikiDocument doc , com.xpn.xwiki.objects.DBStringListProperty as categories join categories.list as category, com.xpn.xwiki.objects.BaseObject obj, com.xpn.xwiki.objects.IntegerProperty isPublished, com.xpn.xwiki.objects.IntegerProperty hidden, com.xpn.xwiki.objects.DateProperty publishDate where doc.fullName <> 'Blog.BlogPostTemplate' and obj.name = doc.fullName and obj.className = 'Blog.BlogPostClass' and publishDate.id.id = obj.id and publishDate.id.name = 'publishDate' and isPublished.id.id = obj.id and isPublished.id.name = 'published' and hidden.id.id = obj.id and hidden.id.name = 'hidden' and (doc.creator = 'XWiki.Admin' or (isPublished.value = 1 and hidden.value = 0)) and obj.id = categories.id.id and categories.id.name='category' and category in () order by publishDate.value desc]]. Click on this message for details.